Ain’t No Party Like a West Coast Party…Screeeeech…with Chaperones. Last night, my husband and I helped a friend chaperone his 15 year old daughter’s first (and I think last) high school party. His daughter had a great idea of quarantining all the adults into one room so it would still seem like a party. She even put up a sign, so we could understand our place. Yeah, we stayed in the kitchen with watchful eyes, periodically frightening the teenagers with our aged presence. Being a chaperone at the party made me feel simultaneously 1000 years old and also kinda hip, because I knew what they were all up to. Things haven’t changed that much since I was in high school. They weren’t even trying to be slick about sneaking things in. I mean, who carries a duffle bag to a party? Did you just come from the gym, buddy? Do you think I think that’s just a coke, stumbling young lady? And I know that’s not a new fragrance, called “Eau de Pot,” kids. I applaud my friend for calling in the adult reinforcements. I can’t remember going to a high school party when I was in high school that had parents at it, trying to keep the liquor and drugs out. I even remember a few parents supplying the liquor. In retrospect, I am now horrified at that. We made periodic rounds throughout the house to confiscate liquor. If 15-year old me had seen 33-year old me doing this, she would have been mortified. Toward the end of the night, my husband made a round to collect all the contraband (again) and came back with a giant Hefty bag of liquor. Damn, these kids are sneaky. At one point, a girl waiting for the bathroom took a giant swig of rum from a bottle (classy), because apparently, she forgot there were parents 10 feet away. I told her she needed to pour it out. She looked terrified that she had been caught, but then proceeded to gulp it down on her way to the trash, gurgling, “I’m sorry!” Girlfriend puked about an hour later, which is a far worse punishment than being caught by me. The whole time, I couldn’t help thinking about adolescent development. I know, I can’t shut it off on the weekends. It’s a curse. I know that some amount of risk taking is normal for adolescents and may even be biologically driven. And it is certainly amplified in large groups of peers (great, the whole school was at the party). Teenagers also take longer to make decisions about risky behavior than adults (even in deciding about fairly obvious risky situations like whether you should swim with sharks or drink Drain-o). You might think that thinking longer about a decision is good, but paradoxically, thinking longer about a decision is kind of bad, because it should be instinctual not to drink Drain-o. At this party, the kids were calculating the risk of being caught by the adults with the social-emotional drive to engage in novel, exciting, and emotionally-charged behaviors. Guess what won in the end? We shut down the party at midnight on the dot. I felt a bit uneasy about letting these kids find their way home. Fortunately, they can’t drive yet. I was torn between my psychological theory (risk taking and experimenting is normal) and my maternal instincts (You’re only 15! Come little children, I will drive each and every one of you safely home and counsel you on the dangers of drugs and alcohol). Like the kids, I too was torn between my rational brain and my emotions. I knew from research (and my own experiences of getting home from parties), that the kids would live to tell about how some old lady (me) made her throw away her rum and how their coach busted them with a 40 oz of crappy beer. I know my friend did everything possible to keep the party drug and alcohol free without humiliating his daughter by frisking everyone who came in. He even recruited his daughter to be the main enforcer, and she did. On the way home, I asked my husband if he would ever let our future teenagers have a party at our house. He said he would, if we were there. I suppose I would too, only I fear that maternal-me would run into the living room and exclaim, “Surely you all would be just as entertained with a rousing game of Scattergories!” My daughter/son would die of embarrassment. Surely it’s better to not have a party at all. Then again, my daughter/son would just find another party and who knows if the parents would be as vigilant as my friend. Then AGAIN, I went to the unsupervised parties as a yoot and I think I turned out fine. I love how I am pre-worrying about a fictitious high school party 16 or so years from now. I know I have more empathy for parents after last night. In the abstract, and from our own experience, we know that risk taking is normal. In reality, it is hard to watch. Especially the making out in the hallway for 20 minutes. Classy. Comments on Ain’t No Party Like a West Coast Party…Screeeeech…with Chaperones. I am surprised by how brazen these kids are. Where I live, few teenagers would try to sneak contraband into a party that was supervised thoroughly by parents. I applaud your friends for being so vigilant. I am already nervous for my unborn child to turn 13. As for my teenage years – far too nerdy…far FAR too nerdy to try that in front of my parents or ANY parents for that matter. I'm sure they were thinking that you are fabulous the whole time. You are a BRAVE woman! I was hoping to hear some of the music selections… I try to stay current (i.e. hip) with my music, but something about The Smiths always calls me back… The more I hear about and experience teenagers (my best friend has teaches 7th grade AND has two teenage sons), the more I appreciate the innocence of my kindergartners. I'll take the occasional pee pants over pot smoking, making out, and condoms. Yikes! I agree with Edie. How big a party was this – Like a hundred kids? Or just a dozen or so? I'm only 25 and graduated high school in 2002, and except for the kids with real substance abuse problems at that age, drinking wasn't attempted in front of adults. Did the kids have the whole run of the house, and the parents were expected to stay in one room? @Edie and Steve: I know! I was such a rule-follower at that age, I can't imagine being that bold. I think in general, there are some pretty liberal-free-to-be-you-and-me kind of parents in my community, so the kids were surprised to have an adult presence that didn't support underage drinking. Kids today! (I've always wanted to say that). @Mimi: I am sure they were impressed most by how I thoughtfully arranged the cookies in a rainbow array with each arc a different flavor. How cool am I? 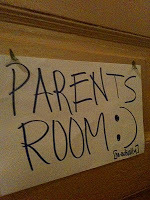 It's funny how teenagers believe that adults have their place in a separate part of the houss. As a parent of three adults, I have been there, done that, and it's all hit or miss. There is no way to be the perfect parent. I learned (after the fact) that my kids' friends didn't like to spend the night at our house because I checked on them throughout the night. So, the choice was to go to another house. Of course, my kids were invited. I love that on the sign, she used an emoticon instead of a regular smiley face. I'm not *that* old (I'm a 26-year-old school psychologist in Alaska), but it makes me feel old nonetheless. Oh, eesh. I'm just going to pretend that my son will never turn into a teenager. Then again, I was a remarkably well-behaved teen. Mostly because I was lame, but still. Re the above comment: the only exception to the aforementioned good behavior was at church lock-ins.